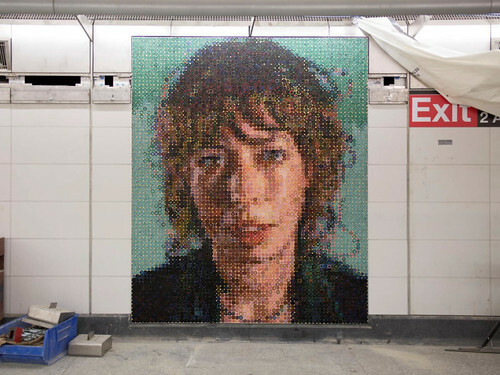 It’s been a little over three years since we lost Lou Reed, but the legend will live on in the form of a colossal mosaic by Chuck Close, to be unveiled next month as part of the 2nd Avenue subway. Today at the Museum of Modern Art, Governor Andrew Cuomo– who lately has been all about beautifying our transportation hubs— announced that the artwork of Close, Sara Sze, Vik Muniz and Jean Shin will be displayed on the walls of three new stations, plus the new entrance of a fourth, when they open January 1. 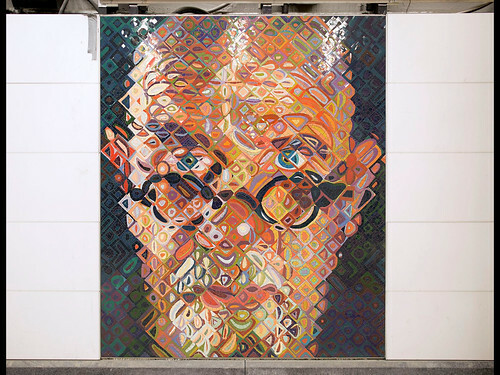 As part of this “museum underground,” as Cuomo called it, Chuck Close’s “Subway Portraits” will grace the walls of the 86th Street station, near the entrances and on the mezzanine concourse. Nearly nine feet tall, the Noho artist’s 12 photorealist works portray Philip Glass, Zhang Huan, Kara Walker, Alex Katz, Cecily Brown, Cindy Sherman, Lou Reed, and Close himself. As you can see, the portrait of artist Cecily Brown is indeed markedly different from Close’s more abstract self-portrait. Watch the video and you’ll also see glimpses of Sarah Sze’s “Blueprint for a Landscape,” at 96th Street, Vic Muniz’s “Perfect Strangers,” at 72nd Street, and Jean Shin’s “Elevated” at 63rd Street. I love it. They are beautiful. Well done. Close is the Trump of the art world. I wish to know the basis on which you would make such a statement. What about his life, his art, or his political background moves you to make this comparison? That would be true if he had painted for the first time last week.